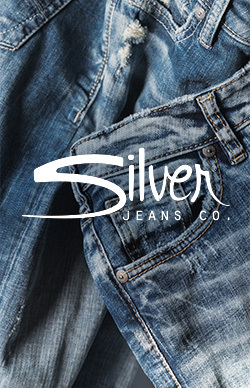 Established in 1991, Silver Jeans Co.’s rich history and family heritage are what make us truly one of a kind. The company is an extension of Western Glove Works, which was founded by the first generation Silver family in 1921 and holds the spot as the second oldest privately held denim producer in North America. Translation: the Silvers have been designing denim for nearly a century. So yeah, you could say we know a thing or two about jeans. Fit is at the core of everything we do, and it has been from the get-go. Our first silhouette, a unisex jean called the "Frisco," launched in 1991 and went on to sell 2 million pairs. And that was just the beginning. Since then, our collection has expanded to include a variety of fits for literally every body. Straight, curvy, tall, short, slim, muscular or somewhere in between, our men’s, women’s and plus size lines integrate every iteration of a jean imaginable. Seriously. And it helps that our design team is made of real people, with real bodies, of all shapes and sizes. So we’re not just designing jeans for you, we’re designing them for ourselves. We live in our Silvers, and we think you should, too. Our roots in workwear mean quality and craft is in our genes (pun intended). With an emphasis on skill and unrivaled attention to detail, our denim is built to last—premium, high-quality fabrics, reinforced stitching techniques, rivets and buttons with incredible strength. Our jeans are crafted with integrity, authenticity and most of all, sustainability. While other pairs you own might end up in a landfill, ours will live in your drawer for years to come, and like some of the best things, get even better with age. Family. Fit. Quality. Craft. That’s Silver.